Labra is a delicious dish of West Bengal. It is a kind of mix vegetable recipe that is fulfilling and is also a nutritious curry. It contains several kinds of vegetables cooked on sim flame along with light spices. It is served hot along with rice. Labra is a regular item in the daily food chart of the Bengalis, however, this is also considered to be an important recipe for the festivals and celebrations. Since this is an onion-garlic free dish, it is offered as Bhog Prasad at Durga Pooja along with Kichuri/Khichdi. 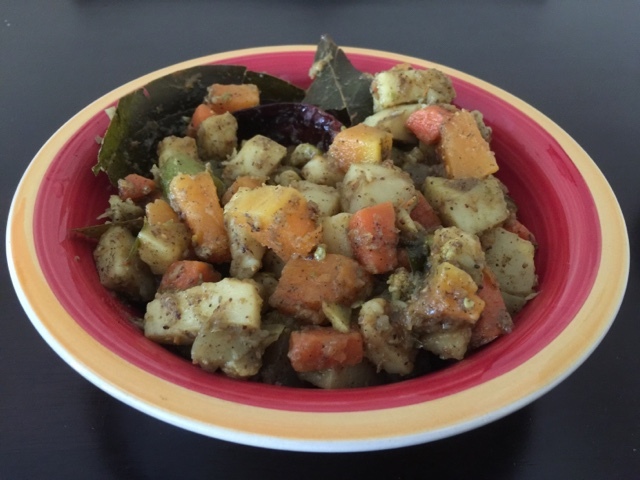 If you are also a curry lover, you will certainly like this simple and quick recipe. Try making Labra according to the instructions given below. To make the Paanch Phoron Masala Recipe, preheat a small pan on medium heat. Dry roast all the Paanch Phoron ingredients until well roasted and you start smelling the aromas of the roasted ingredients. Once roasted, turn off the heat and allow the seeds to cool. Once cooled, powder the Paanch Phoron Masala in a grinder. Store the Paanch Phoron Masala in airtight bottled in the freezer for its freshness to last for a long time. Wash and cut the vegetables and keep ready. Bring skillet with oil to heat add Red Chili, Bay Leaf and Paanch Phoron masala. Let it crackle. Add Vegetables to the skillet in order of the hardness of the individual veggies, I started with carrot, chayote, ivy gourd and cauliflower sautéing for 4 to 5 minutes and now add Potato to cook other 2 minutes. As I added red pumpkin last, since it cook fast. Saute this veggies on medium flame 2-3 minutes. It's time to add Turmeric, grated ginger, amchoor powder and salt. Mix properly to coat with all veggies and let it cook at low flame with closed lid until veggies are soft. Water is not required, as salt added to veggies, naturally water oozes out from veggies to cook. But if you feel veggies are dry while cooking sprinkle some water. When veggies are done add sugar and green chillies to adjust seasoning. Combine and stir well the curry to mix with veggies, if excess water is there let it evoparates. Serve hot with plain rice / roti / khichdi / Naan. You can even use other veggies like - Egg Plant, Field Beans, Sweet Potato, Raw Banana, Ridge Gourd, Beans, Peas, Cabbage, Radish, Zucchini. Instead of Amchoor powder you could add tomatoes. Even a single tomato would be sufficient to give a slight tanginess. Seasoning is typically done with Mustard Oil for this dish. But many does not like the smell of mustard oil, hence you could also use normal cooking oil.